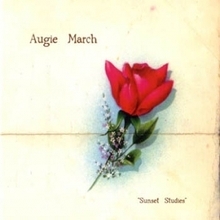 Augie March's Strange Bird was just that: a strange bird. With lush instrumentation, bold and beautiful writing, and very consistent quality, it was a rare thing to find in what I can only categorize as Almost-Rock. It was a pleasant surprise, lovely and accessible yet still challenging and serious at times - for every soft ballad my mom liked, e.g. "The Night Is A Blackbird," there was something searing and atypical like "Brundisium," and everything between was solid. Here's the original review. After I got that album, I sought out their earlier LP, Sunset Studies. I think it's most accurate to describe it thus: it's the same, only less so. The album is still good, don't get me wrong, but it's like when they made Strange Bird, they just doubled the intensity of this album and re-released it. Consequently, while it's still pleasant, and frequently unlike most other almost-rock you hear, it's a little easier to forget. The standouts stand out more, though, and they're great. "The Hole in Your Roof," "The Good Gardener," "There Is No Such Place," "Heartbeat and Sails," all of these are excellent songs, and unfortunately the area between them sags somewhat. Outside of those songs and the final one there is little adventure to be had, nice as it sounds. There is also one kicker - "Owen's Lament," the last song, is fantastic. Long, beautiful, and almost intolerably tragic-sounding, it is by far the best song on the album - at least, in my opinion. I'll let you decide for yourself. Give these tracks a listen, but if you really want the best introduction to this band, go for Strange Bird. Here's "Heartbeat and Sails," and here's "Owen's Lament." I love that song! nice posting Augie March are a unique and special band. have to disagree about sunset studies though, i think its just as good as strange bird, in fact for me the only difference is that the playing on strange bird is more concise. before the two albums there were two mini albums. Tthanks For The Memes" sprawls a bit musically while the follow up Waltz is the true start of the bands vison. both are essentual as is the brilliant new album Moo You Bloody Chorus and i should also mention the superb dvd collection from last year which includes a full concert with a horn section, all the promo vids and other live delights. Like Daryll Ann, The Mutton Birds and Sugarplatic, Augie March are special and deserve all the exposure they can get. The standouts stand out more, though, and they're great. I love the way the people here interact and shared their opinions too. I would love to track your future posts pertaining to the said topic we are able to read. I find it strange somehow.